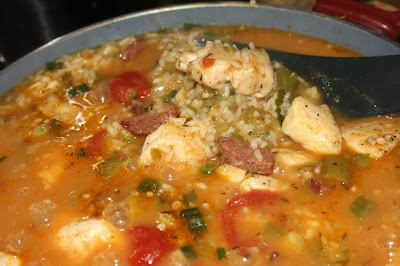 A cross between gumbo and jambalaya, this quick and easy skillet meal packs a burst of gumbo flavor, but without the usual lengthy time commitment - great for busy weeknights. 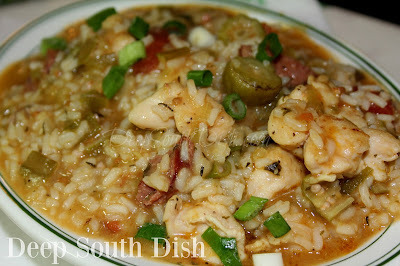 This is a great skillet meal that's a bit of a cross between gumbo and jambalaya. It's another one of those quickie dishes that I'm making while I work my way through getting whatever gardening and planting I want done before summer heat sets in. When I was a 30 and 40-something, I used to be the most organized person. I had my journals and planners, my calendars and my schedules, a place for everything and everything in place. As I've gotten older, things have shifted though, and I seem to have become the most disorganized person in existence. Maybe it's because my priorities have shifted from a corporate career to retirement, but I just can't seem to get my act together anymore, I guess because I don't have those pressing matters determined by someone else hanging over me. Y'all would not believe the blogging opportunities I have turned down - spending time in Los Angeles to film a food-related game show, all sorts of TV competitions, and multiple opportunities to work with a wide variety of brands alongside other bloggers - mostly because it involved overnight travel. At this point in my life, I'm a major nester, and I just really like being at home, relaxed and close with my family and my four-legged babies, and the whole thought of travel just stresses me out, no matter how fun or interesting or glamorous it may seem. And that's really okay with me. Whatever 'Type-A' I once had in me, has faded away now to 'Type B,' and I'm sure enjoying being me at my own pace. I love not having to get up to the startle of an alarm these days, or having to prioritize my world based on other folk's needs and expectations. Course, I guess that doesn't make me the most ambitious blogger either, but I'm okay with that too! I'm just a cook, sharing my recipes here, not somebody who is looking for the spotlight, a television show, to be famous, or anything remotely like that. I worked hard for other people for more than 30 years straight. I've earned the right to relax a bit! Anyway.... for this skillet meal, I wanted a result that was less dry than jambalaya and a bit more juicy if you will, but not soupy and definitely not gummy rice. The sort of texture you have when gumbo hits a bowl of rice and co-mingles. I think I've got it. For this skillet dish, and others like this, I prefer to use a quicker cooking instant rice over long grain, so I tend to keep some in the pantry for those busy days. The rest of the time, it's the rice cooker, the pressure cooker (brown rice pilaf in 10 minutes y'all) and sometimes even in my Fasta Pasta if I only need a little bit! I've used long grain before, and even stirred in already cooked rice, but I like the texture much better with minute rice and it is perfect for this dish. I hope that you enjoy it as much as we do. As always, scroll on down the page, past the step-by-step photos to find the full recipe text, with measurements and a printable to take to the kitchen. Here's how to make my Skillet Gumbolaya. By the way, I used the mini bowl on my new food processor to mince the vegetables. Ya'll may remember, my old food processor, while still working, was duct taped together, so not really very counter-worthy, so I bought a new one. I have to admit, I'm really enjoying finally having a food processor out on my counter and I've been using it a lot, having gotten over the whole "woe is me, if I use that, then I have to clean all of this" that, like everybody else, I was also thinking. I've actually used it a lot, and just a quick rinse as soon as I'm finished, and I can stack everything up and give it a quick wash with hot, soapy water after dinner. Heat 1/2 tablespoon of the oil in a deep and large, lidded skillet - I use a chicken fryer - over medium high heat. Add the sausage and cook until lightly browned, about 3 minutes; remove and set aside. Cut chicken breasts into chunks, seasoning to taste with salt and pepper and/or Creole or Cajun seasoning. Add another 1/2 tablespoon of the oil and cook chicken in batches, only until lightly browned adding oil as needed; remove and set aside. Add remaining oil and the vegetables; cook stirring regularly for 3 minutes; add garlic and cook another minute longer. Sprinkle in the flour and cook, stirring constantly for 3 minutes. Stir in the seasonings. Begin adding the liquid a little at a time, stirring until blended. I use hot water with Better than Bouillon chicken base, but you can use boxed commercial chicken broth if you prefer. Stir in the tomatoes (diced or stewed, chopped up) and okra, bring back to a boil, reduce heat to simmer, cover and simmer at a low bubble for 20 minutes. Return the sausage and chicken to skillet. Set aside a pinch of green onion for garnish if you like, then stir in rice and remaining green onion. Bring back up to boil, reduce heat to simmer, cover and continue cooking about10 minutes longer. Remove from heat and set aside; let rest for 5 minutes. Rice will not completely absorb the liquid. Serve this with some iced tea, French bread and a nice mixed garden salad. For more of my favorite skillet and stovetop meals, visit my page on Pinterest! Heat 1/2 tablespoon of the oil in a deep and large, lidded skillet, such as a chicken fryer, over medium high heat. Add the sausage and cook until lightly browned, about 3 minutes; remove and set aside. Season chicken to taste with salt, pepper and/or Creole or Cajun seasoning. Add another 1/2 tablespoon of the oil and cook chicken in batches, adding oil as needed, only until lightly browned; remove and set aside. Add remaining oil and the vegetables; cook stirring regularly for 3 minutes; add garlic and cook another minute longer. Sprinkle in the flour and cook, stirring constantly for 3 minutes. Stir in the seasonings, mix together water and base, then begin adding the water a little at a time, stirring until blended. Stir in the tomatoes and okra, bring back to a boil, reduce heat to simmer, cover and simmer at a bubble for 20 minutes. Return sausage and chicken to skillet. Set aside a pinch of green onion for garnish, then stir in rice and remaining green onion. Bring back up to boil, reduce heat to simmer, cover and continue cooking 8 to 10 minutes longer. Remove from heat and set aside; let rest for 5 minutes. Rice will not completely absorb the liquid. Serve this with some iced tea, French bread and a nice mixed garden salad. Cook's Notes: May also add or substitute shrimp, adding it in the last 10 minutes. Be mindful of the salt content of the chicken base you use before adding additional salt. You may also substitute all chicken broth for the water and base. Love the deep south dishes. Quick question, I don't have minute rice. :( how many cups of regular refined white long grain rice do you use instead? Next time I'll make sure to get minute rice. I've got the same issue. I was thinking of cutting the water back to 2 cups and cooking the rice by itself. Then stir in the rice just before serving. I wrote this one using the instant rice so I'm not sure, but I think stirring in the cooked rice would probably be the better way to go. When I've tried cooking long grain in the past in skillet meals, it just gets too gummy. Instant rice doesn't have that issue. Thank sure looks guuud. I need to get some more sausage then I'll be cooking up a big pot. Thanks. Thanks Michael! Please let me know what you think when you do!! Si Bon. Everyone loved it. Thanks again. Thank you Michael - glad to hear y'all enjoyed it! Just found your blog and LOVE it! We have lots in common, too. Our whole family (almost) are crazy about spicy food, and we are all southerners. Trying new and different foods is fun, but I always fall back to the basics my Mama raised me on. Thanks so much Pam! The basics are the best!! I just found your blog last week and have looked at every post! Your recipes and commentary are so fun. My husband is from Gulfport and loves just about everything you've posted about. Now I have a good place to go for recipes he'll like. My Midwest/Iowa recipes are sometimes not exactly what he likes. :) Thanks for all of your work on your blog! Aw, what a sweet comment - thank you!! Thanks John! Glad you enjoyed it!! Love your recipes Mary! As a Louisiana native and former chef, people thought I was crazy when I said my specialty was southern food.Then the craze hit and I had the last laugh! I'm going to make this tonight. Ain't it the truth? Only problem is the "southern" food that's being promoted everywhere these days is some new south thing or fusion. Although I'll enjoy that from time to time like anybody else, I'm just an old fashioned southern cook sharing my mostly old school recipes! I don't really get too fancy here. I hope that you enjoy trying this one - I think it's a great quick skillet meal and The Cajun approves of it so that's always a bonus! Good Lord woman!! You've had me cookin' up your recipes the past 3 weeks now. They just get better n' better!! Awww... you just made my day Farmer Jo!! I'm so glad that you're enjoying trying out some of my recipes. Thanks so much for taking the time to stop back by to let me know, and lift me up! I needed it today.